The Rolex Submariner is probably the most iconic watch of all time. With its timeless design, and satisfyingly substantial size, there isn’t a Rolex lover in the world without one of these in their collection. First released in 1953, the Submariner was designed as a professional divers watch, offering the exceptional water resistance and reliability required by underwater professionals. But despite being designed for the extremes of underwater adventure, the Submariner, it turns out, also sits perfectly next to a shirt cuff, or even a casual sweatshirt. From the depths of the ocean to your office desk, there’s almost no situation where a Submariner doesn’t do exactly the job you want it to do. Since its release in 2010, the reference 116610LV, affectionately known as ‘the Hulk’, has become a highly coveted incarnation of the Submariner. There’s one big reason why the reference 116610LV stands out from most other Submariners. It’s got a green bezel. Traditionally bearing a more subdued black or blue bezel, the green bezel of the 116610LV makes it instantly recognisable. But the Hulk isn’t the first green Submariner, nor is it the only one. The original green Submariner is actually the 50th anniversary reference 16610LV, released in 2003. The 16610LV ‘Kermit’ does not have all the features of the Hulk, but remains truer to the traditional styling of the Submariner. The Kermit is no longer in production (it was discontinued in 2010 to make way for the Hulk), and is therefore generally a little harder to get hold of. It’s perhaps not a surprise that the Kermit raised some eyebrows when it first came to market. Rolex are not known to make bold changes to their watches, and to see a Submariner with a green bezel was not to everyone’s taste. Yet over the last decade or so, the watch community in general and the Rolex community in particular have really warmed to both the Kermit and the Hulk, to the extent that both are firmly in demand today. So what’s special about the Rolex 116610LV, and what makes it different from its older brother, the 16610LV? The most obvious difference is the dial. While the Kermit embraced green for the bezel, its dial was a more subdued black. The Hulk, however, has gone all out with green, and features both a green bezel and a green dial. The colour green has always been part of Rolex’s brand identity (it’s the colour of the presentation boxes, for example), although few watches, besides the Milgauss with the green tint on its sapphire crystal, feature green on the watch itself. So the 116610LV takes things to the next level. While the Milgauss features just hint of green, and the Submariner 16610LV a green bezel, the Hulk with its green bezel and dial is thoroughly green. It also features an important upgrade – the bezel is made of Cerachrom. First patented by Rolex in 2005, the ceramic material now used to make their bezels supersedes the aluminium bezels on earlier models. Derived from the English ceramic and Greek chrom (colour), Cerachrom is designed to withstand extreme conditions. It is exceptionally resistant to scratches, and also to ultraviolet light, preventing its colour from fading. 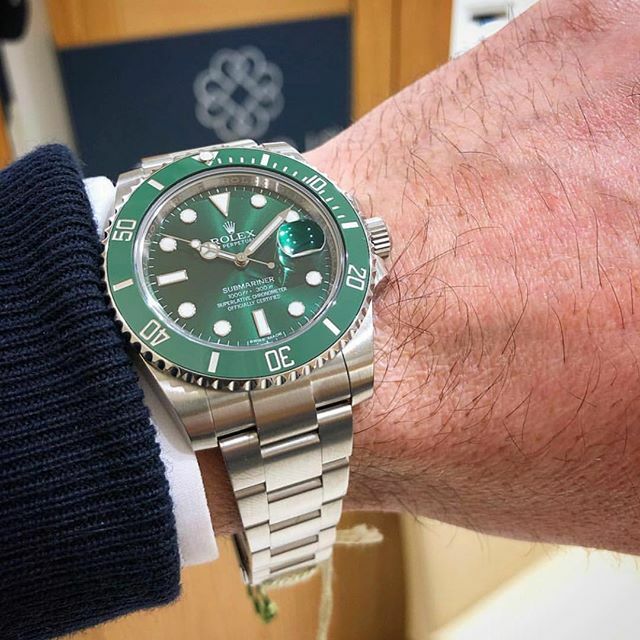 Although the 116610LV and the 16610LV both measure up at 40mm, the Hulk bears slightly larger lugs, making its appearance on the wrist slightly bigger than the Kermit. Blowers stock a wide selection of Rolex Submariner watches. Check our stock today. Not found what you’re looking for? Get in touch and will endeavour to source it for you.